We pulled one of our new large-size YOLO Compost Tumblers out of our oven last Monday, just in time to have a unit ready for display at Decorex. Now that I have it at home, I can experiment with contents to get a feel for the amount of material that can go in, how quickly composting takes place and also to assess the weight of a shell when it is full. I have a compost heap at home. In two years I have never turned it. I have done little other than to toss grass cuttings and leaves onto it. I don’t have much space at the back for the heap and no structure for it either. I also have little space available to turn the pile (and even less inclination). The heap exists because I didn’t want to throw out any of my home and garden waste with the trash. I started by shovelling a load of shredded leaves and dry grass from the compost heap into a wheelbarrow (three loads full) and tossed it into one 200 litre shell. This material has not composted at all. I also added a 1/2 wheelbarrow full of unfinished compost from the shell of my small YOLO Compost Tumbler. And then I watered the contents because they were very dry. The volume was around 2/3 full. The shell is easy to turn even with all of this material in it. The first load of contents added to my large YOLO Compost Tumbler shell. We’ll add a lawnmower grass-catcher load of freshly cut grass this afternoon. 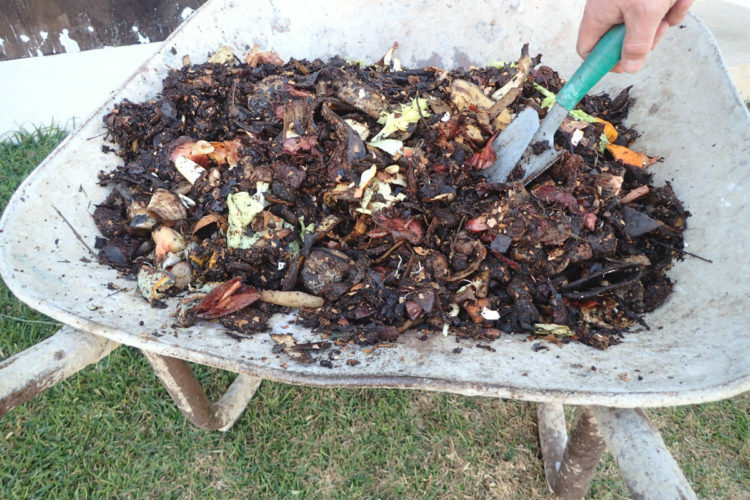 As with every shell of compost that is created – from kitchen waste or garden waste – every mix is different as materials added change seasonally. 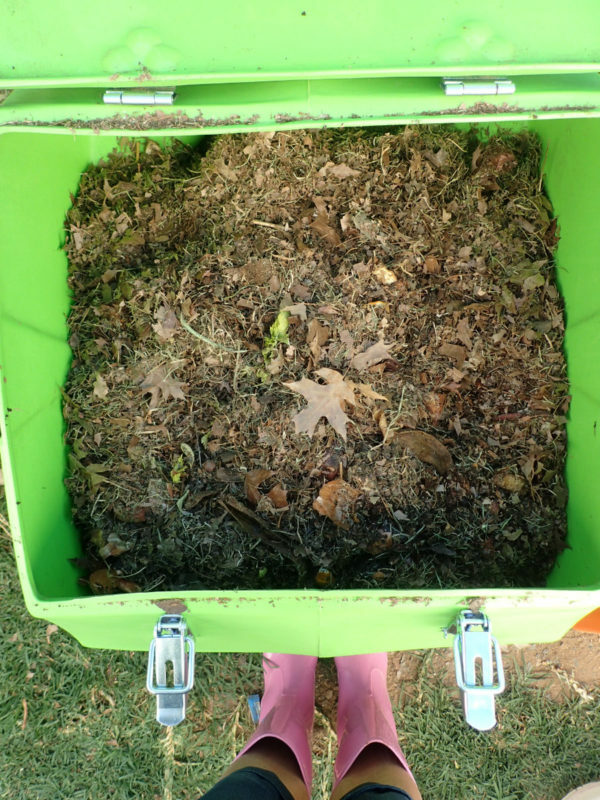 What you add affects the composting time. 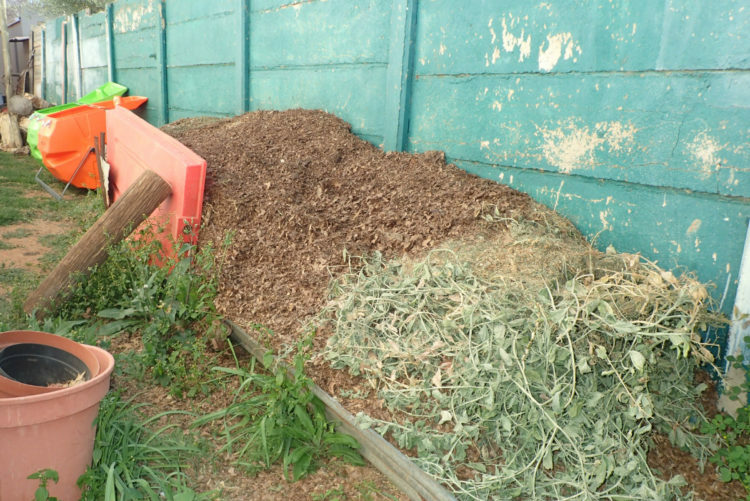 As usual, the smaller the pieces of material, the faster the composting process. I expect to add quite a bit more material as the contents decompose and reduce their volume. I also expect it to get hotter in here than in my small-size YOLO Compost Tumbler because there is so much more material in the large shell. Once I get the contents to 3/4 full, the time for the last added contents to mature should be around six weeks and I estimate that the weight of the finished compost will be around 30kg. My garden will love this! I’ll update you in a week or two as the composting process gets underway. My aim is to work my way through our compost heap, maturing the contents in my YOLO Compost Tumbler so that I can do away with the compost heap entirely by the end of summer.